The next road we took was Icefields Parkway, which parallels the Continental Divide. It goes from Jasper to the turn-off towards Banff (Highway 1, the Trans-Canada Highway). 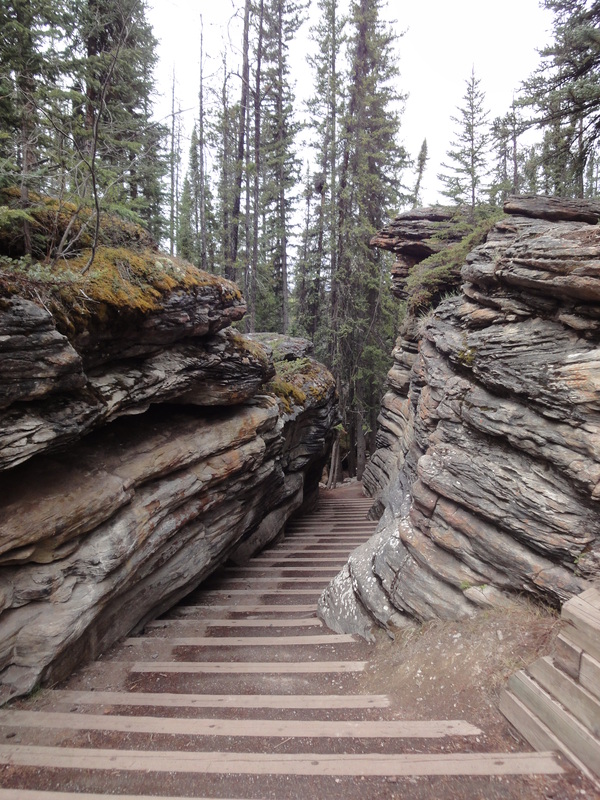 Just about 30 kms (10 miles) south of Jasper, is Athabasca Falls. 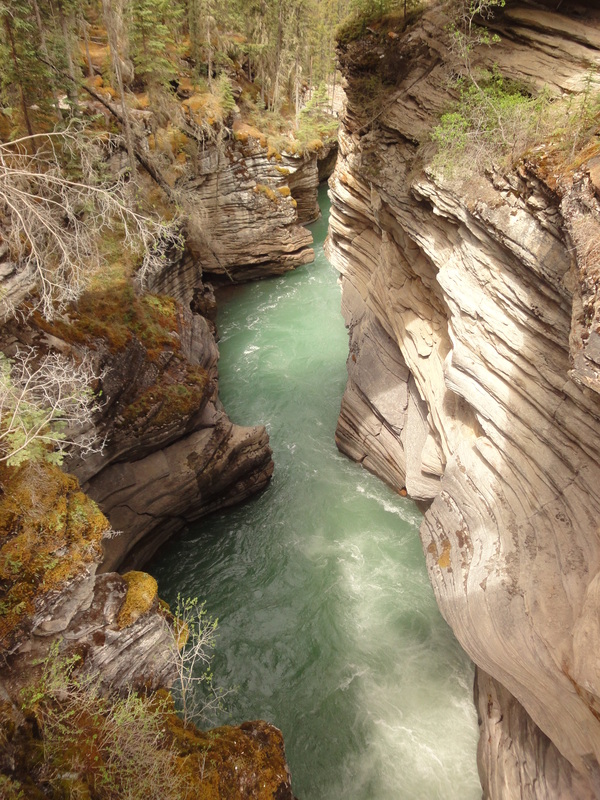 The Athabasca River runs through a riverbed of quartzite and limestone, which has finally eroded and carved out gorges and potholes, creating this beautiful scenery! It is very accessible, has a parking lot, boardwalks, and restroom facilities – not really “roughing it”, which works out well for most people. And for those who want more of a challenge ~ well, it’s still worth the stop on your way to wherever it is you are going! 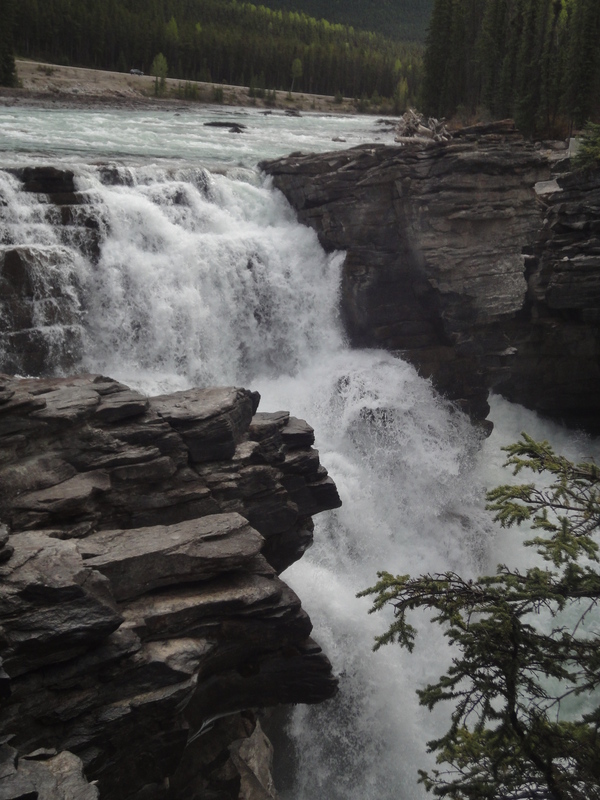 And, Athabasca Falls’ headwater is the Columbia Glacier, which is part of the Columbia Icefields, about 70 kms further south. 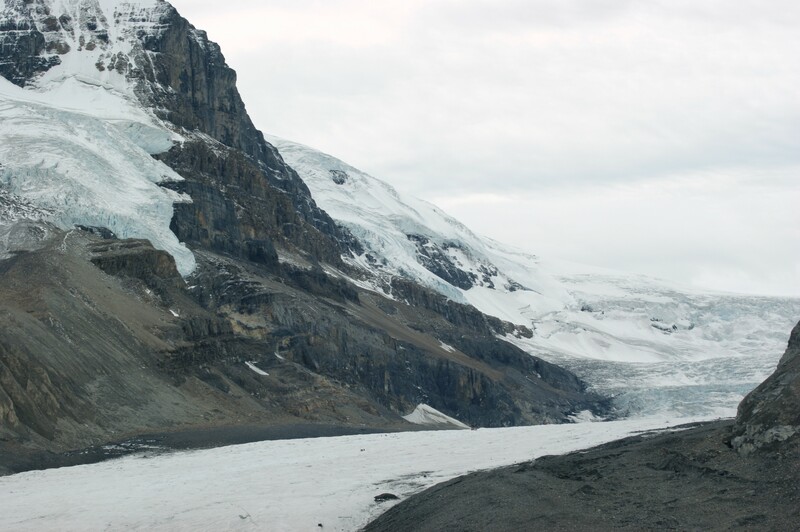 Conveniently located right on the side of the Icefields Parkway, is the Columbia Icefields Discovery Center and the Athabasca Glacier. 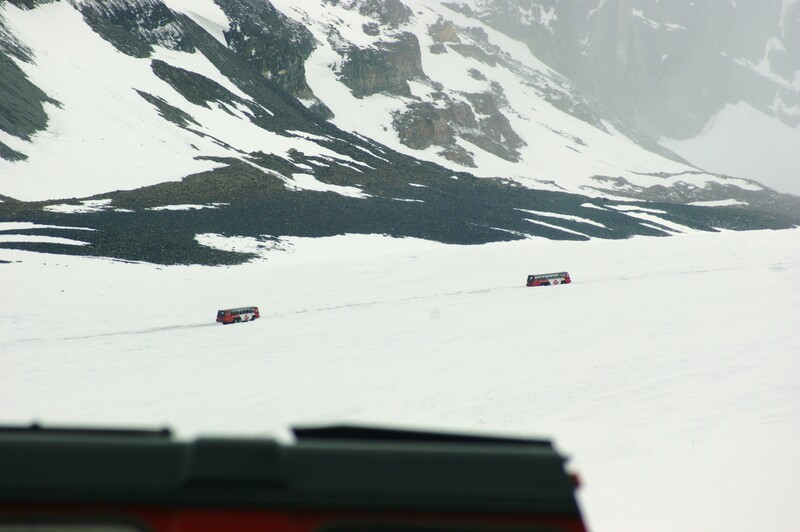 You can walk TO the Athabasca Glacier from the convenient parking lot, but you are not allowed to walk ON it, since it’s steadily receding. Apparently, it recedes at a rate of about 5 meters (16 feet) per year. If you hurry, you can still visit this one, though – it’s still 6 kms long and 1 km wide…. when you walk towards it, however, there are signs and markers along the way of how far the Glacier extended at which year… it enforces how important it is to obey the “don’t walk on this” rule. You CAN take a guided bus ride on to it, by way of a “Massive Brewster Ice Explorer” (a great big bus specifically for driving up the glacier), for which you can sign up at the Visitor’s Center. They operate from mid-April to mid-October. 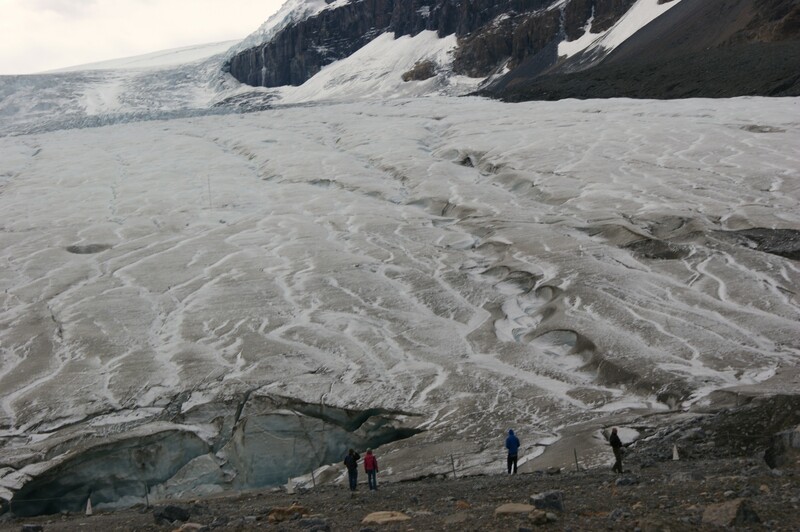 The Icefield extends from Mount Columbia (3747 meters/12,294 feet tall) on the west side to Mount Athabasca (3491 meters/11,452 feet) on the east side. It covers approximately 215 square kms (although I’ve seen a couple of reports that say 325 square kms? ), and can be up to 360 meters deep… Interestingly, up to 7 meters of snow falls during the winter each year, which is more than can melt during the summer, so it continues to add mass. 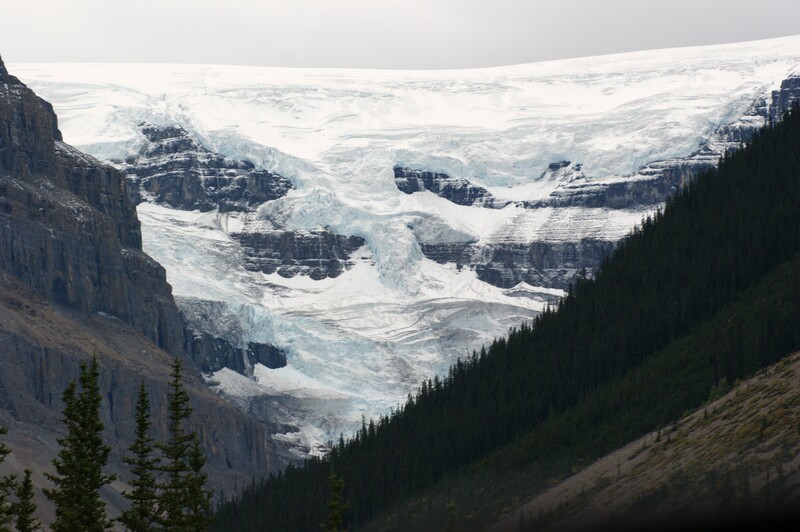 There are 8 major glaciers, including the Athabasca (of course), the Dome and the Stutfield (both also can be seen from the Icefields Parkway), and the Castleguard, Columbia, and Saskatchewan. The Icefield caps the Continental Divide and the water splits into three at Snow Dome (3,456 meters/3,456 m (11,339 ft) tall), and pours into the Arctic, the North Atlantic and the Pacific Oceans. 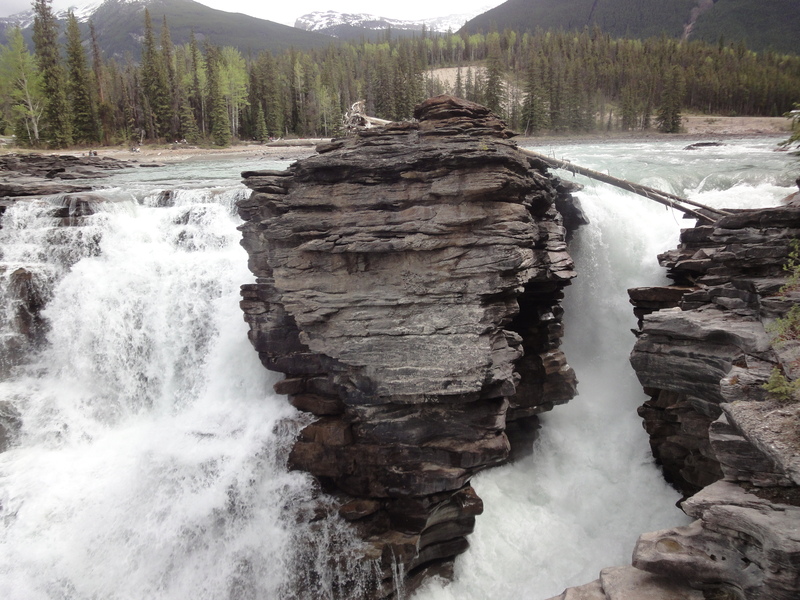 In fact, the headwaters of the North Saskatchewan River are here, as well as the Columbia Basin. Next stop: Banff National Park.